Tavares has spearheaded cost-cutting at PSA and before that Renault. Now Opel is in the firing line. FRANKFURT -- PSA Group CEO Carlos Tavares, who is no stranger to thrashing out difficult labor deals, is now taking on Germany's powerful IG Metall union, which has been the undoing of many a cost cutter. PSA is demanding pay curbs and other concessions from workers at Opel, the money-losing German automaker it bought from General Motors last year, in return for new investment. The standoff could quickly take a political turn, amid reports PSA is also looking to shed thousands of jobs. Tensions have mounted at Opel since German workers called Tavares' bluff last week, by rejecting demands they waive the 4.3 percent pay increase negotiated by IG Metall nationwide. In response, PSA put investment plans on hold for the Eisenach plant in central Germany, tabling no new proposals. Unions fear the group may now begin planning to wind the plant down, triggering an all-out confrontation. Eisenach will lose Corsa subcompact production to Opel's plant in Zaragoza, Spain, after the model is updated next year. The plant would have built the new Grandland SUV under the paused investment, sources have said. The Grandland is currently built in PSA's factory inSochaux, France. The plan would sustain only about half of the plant's workforce of 1,800, union representative Wolfgang Schaefer-Klug said after a works council meeting on Thursday. Opel could also cut 2,700-3,700 of the 7,700 jobs at its Ruesselsheim research center near Frankfurt under scenarios discussed at the meeting, business magazine Wirtschaftswoche reported. PSA human resources chief Xavier Chereau had warned of "consequences" if IG Metall rebuffed management proposals, after other unions in Spain and the UK agreed concessions, according to a union source with knowledge of the talks. "We told him [Tavares] IG Metall is not like other unions," he said. German Chancellor Angela Merkel intervened publicly on Wednesday, saying PSA must honor commitments made prior to the acquisition when Tavares told German leaders there were no plans for plant closures or compulsory layoffs. Western automakers typically use plants in low-cost countries as benchmarks, warning higher-wage workers that failure to narrow the productivity gap could endanger their jobs. Pressure on manufacturing costs has increased with investment demands for connected, autonomous and electrified car development. GM is now employing similar tactics to seek concessions from its South Korean workforce. GM failed to end Opel losses over two decades, hemmed in by German "codetermination" laws granting workers board seats and by IG Metall - which has thwarted or altered the plans of companies ranging from Volkswagen Group to Tesla. In Europe, French automakers have led the squeeze on labor, extracting pay freezes and working time flexibility as investment recovered from the last major financial crisis. Renault, where Tavares was second-in-command before he moved to PSA, struck a deal with Spanish workers in November 2012. That in turn helped cajole French unions into signing a similar pact three months later. PSA, under then CEO Philippe Varin, followed suit. Such deals are part of the reason why PSA and Renault now regularly post automotive operating profit margins above 6 percent, compared with their 2 percent to 3 percent pre-crisis norms. By contrast, Volkswagen's namesake volume brand raised its margin to 4.1 percent last year from 1.8 percent. Opel and British sister brand Vauxhall lost 179 million euros ($221 million) for a negative 2.5 percent margin in the last five months of 2017, after PSA took control. 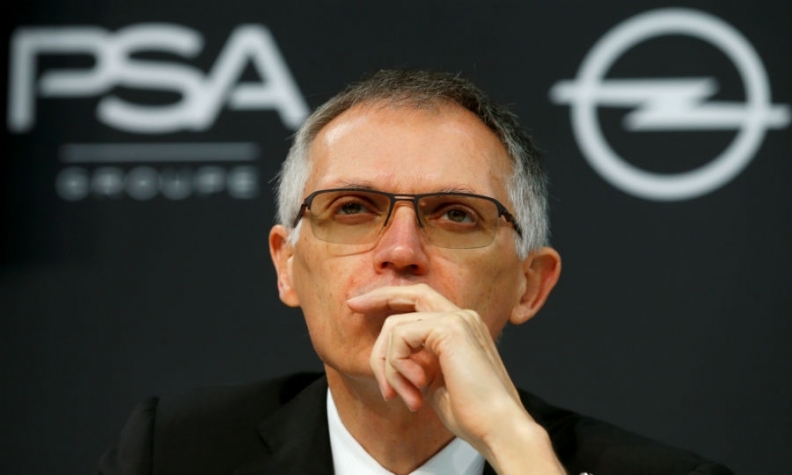 PSA has said it discovered the full extent of Opel's problems only once it had closed the acquisition - and months after giving assurances that no closures were necessary. "IG Metall wants to apply the same methods it always has, which cost Opel 20 years of losses and 50,000 jobs," said a source close to the automaker. PSA referred Reuters questions to Opel, which said it remained hopeful that "codetermination-based dialogue" would achieve a deal. "We want to pave the way for a sustainable future by unleashing investments based on the right level of competitiveness," a company spokesman said, adding it aimed to avoid forced lay offs. Tesla became enmeshed in a German labor dispute soon after its 2016 acquisition of robotics specialist Grohmann, before eventually granting a 30 percent wage hike. In one of its earlier failed attempts to halt Opel losses, GM negotiated the closure of its Bochum plant, north of Cologne - but only at the price of job guarantees for remaining workers of the kind Tavares is now seeking to unpick. Staying competitive offers the "only guarantee" of future sustainability for PSA workers and sites, Tavares is fond of saying. PSA is so far refusing to renew the multi-year job and plant guarantees that typically accompany new production investments, according to sources on both sides of the talks, who asked not to be named. Current guarantees on jobs begin expiring this year, while Opel's plants are covered until 2020. "New guarantees are not on the table," said one. Management is now insisting the unions come back with proposed cuts to Christmas and holiday bonuses and other supplementary pay, to offset the basic wage increase they refused to suspend. Any PSA concessions on Eisenach would have likely repercussions for Opel's Ruesselsheim and Kaiserslautern plants and the rest of its 19,000 German workforce. It could also undermine labor agreement across the broader group. "We too have been through tough times and made considerable sacrifices for a competitiveness deal," said Franck Don, a French official with PSA's centrist CFTC union. "French workers wouldn't understand it if their Opel peers were not asked to make the same concessions they had to make. It would definitely create tensions in France." During investor pitches, however, Tavares has placed heavy emphasis on Opel's German identity as a source of export growth potential - a stance that could be undermined by major cuts. IG Metall is confident he will give ground, rather than face prolonged German strikes that could further damage Opel's standing and performance, one union official said. "The brand can't afford to take any more scratches."